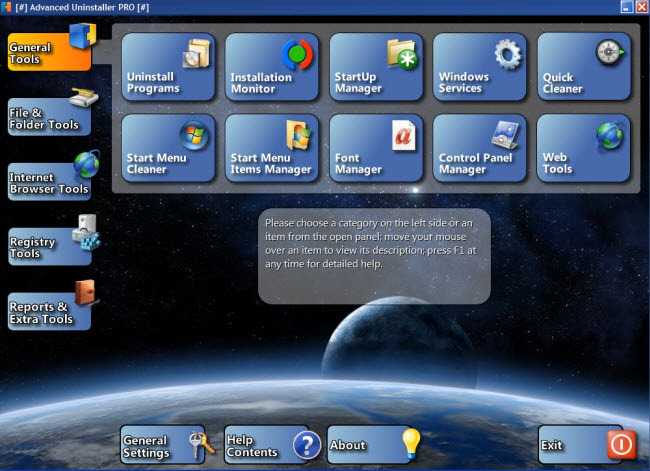 This excellent product from Innovative Solutions is now available to everyone as freeware. Advanced Uninstaller Pro not only provides sophisticated uninstall options but also includes many useful maintenance and management tools. This is the latest full version (10.6) including all features and with absolutely no limitations. Thanks to its extremely intuitive interface, Advanced Uninstaller Pro is one of the easiest and most user friendly programs to work with. Main categories are listed down the left hand side and clicking on each one displays relevant sub-menus across the main window. Mouse over a sub-menu item and a brief description appears in the gray ‘tooltips’ display underneath. 1. Is your traditional uninstall where the main program is uninstalled and the software then automatically and intelligently scans for leftover entries/items – very much in the same manner as Revo Uninstaller. 2. Is via an Installation Monitor tool which records all changes made during installation and creates a log of all information relevant to the setup – (this method does involve an element of risk, more on that later). Reports: Generates reports in HTML and Text formats. Now, back to the matter of monitoring installations: You must bear in mind that the monitoring tool cannot distinguish between the current installation process and any changes which might be initiated by other running applications/software. So, when running the Installation Monitor tool it is imperative that all other applications must be stopped. Innovative Solutions has issued a cautionary guide HERE. A full guide for the Installation Monitor tool, including links to operational instructions is available HERE. i’m guessing you like this program better than revo uninstaller..right? i’ve been using revo free for years..do you suggest i change? i’m guessing you like this program better than revo uninstaller..right? No Voxpop, I haven’t tested this software at all and am not making any comparisons or recommendations, merely presenting the details so individuals can then make their own assessments and decisions. Anyone looking for a monitoring type uninstaller, or the extra tools, could try Advanced Uninstaller Pro and see if they like it. Revo is excellent freeware, If you are a satisfied Revo user then I would suggest you stick with Revo. Jim, Help when I download this uninstaller ,Norton barf’s….saying publisher unknown, certificate unknown, your one of the first to use it. we suggest you not use it. Hey John – It sounds to me like that information is emanating from some kind of Norton user database and the warning is being issued merely because the software has not yet been recorded – but that is just a guess. I scanned the downloaded executable through Avast, Malwarebytes and SAS, all three came up 100% clean. When I actually installed the software for testing purposes, I received zero warnings from any of my security software. an efective product thank you.